After inexperience, the failure to wear a personal flotation device (PFD) is the most common contributor to boating fatalities. Of the thirty-eight fatal Montana boating accidents surveyed in preparation for this book, eleven involved either failure to wear a PFD or wearing an ill-fitting PFD. My correspondence indicates that the figures are similar around the country. On September 14, 1995, Jerry, Staci, Melanie, and Martha put in at Bresentine Bar of the Flathead River, intending to float to Spruce Park Campground. All four were in a seventeen-foot canoe. Although there were four PFDs in the boat, only two of the four wore them. At the confluence of two channels, the heavily loaded canoe got caught in a whirlpool and flipped. Jerry was not wearing his PFD. After surfacing and calling for help, he disappeared. One of the women, after making it to shore, ran to a phone to call for assistance. Rescue personnel arrived within fifteen minutes and brought Jerry to shore, where they administered CPR until au ambulance arrived. They couldn't revive him. The weather on September 14 was mild. It was clear and warm (75 degrees F), and the wind was calm. The water temperature was 54 degrees. The river was relatively calm in this stretch, except for some squirrelly hydraulics. Jerry was thirty-nine years old, and he knew how to swim. 1. Overloading. Four adults (an aggregate weight of nearly six hundred pounds in this case) in a seventeen-foot canoe would severely impede the ability to maneuver and stabilize the boat in difficult currents. While a canoe properly loaded with gear might easily weigh that much and still be stable, four adults-all likely to move around, at least some, in the canoe-are too much. With that much loose, shifting weight in the boat, the margin for error declines significantly. 2. Inexperience. While the operator of the boat (the accident report didn't say who the "operator" was) apparently had more than five hun-dred hours of experience, none of the party had any formal training in handling their canoe. A basic course likely would have given them the skills to handle the converging currents and would have taught them not to overload the canoe. 4. Failure to wear a PFD. In this case, the lack of a PFD was literally the difference between life and death. The two women who wore their PFDs survived, as did the woman who did not wear her PFD. She was lucky. The Big Hole is a popular fishing river, especially in June during the runoff, and many anglers use drift boats with anchors. On June 23, 1996, a drift boat carrying four anglers inadvertently dropped its anchor into swift water and capsized when the anchor caught on the bottom. The anchor rope had a knot in the end so the operator was unable to completely release the anchor when it snagged bottom. There were PFDs in the boat, but they were inaccessible and nobody was wearing one. Three of the four anglers made it to shore. The fourth drowned. On June 23, the air temperature was approximately 65 degrees F, and the winds were calm. The reach in which the accident occurred contained small waves. The water temperature, however, was 45 degrees F, which is extremely cold. The shock of immersion in water that cold can make swimming difficult. Two to choose from. Both whistles need a string to tie off to PFD. Storm whistle is Very Loud. TopKayaker.Net whistle has a clip. Equipment failure and inadequate safety precautions. Throughout the West, anchors are popular on hard-sided drift boats, allowing anglers to stop and fish specific reaches of the river or to moor the boat on shore during a break from floating. In fast, rough current, however, anchors can be dangerous. Further, one investigator noted that the anchor rope had a knot in it that precluded the rope from simply paying out of the boat and eventually releasing the boat before it sank completely. They would have lost their anchor, but saved their boat and the people in it. A fair trade-off. 1. Failure to wear a PFD. While three of the four people in this boat made it to shore, the chances of the victim surviving to reach shore would have been much higher had she worn a properly fitting PFD. 2. Cold water. A water temperature of 45 degrees is so cold that, for many people, the shock of immersion is paralyzing. Breathing can be difficult, and strength and coordination quickly disappear. If immersed long enough, you can simply die of hypothermia, even with a PFD. Without the PFD, your chances of survival decline significantly. Proper clothing might have increased the victim's chance of survival. On July 5, 1994, Bob and Jack were fishing from a drift boat about a mile south of Craig. While trading places in the boat, Jack tripped and fell, hitting his head and falling out of the boat. He was not wearing a life jacket. Immediately after falling in, he started swimming away from the boat toward the middle of the river. Before Bob could get to him, he had drowned. On the day in question, the air temperature was 75 degrees at approximately 1:00 p.m. when the accident occurred. The Missouri in this stretch is calm and relatively slow and poses no structural hazards to swimming. One observer suggested, however, that the water tem-perature may have been in the mid-40s. Jack was in his early seventies. Failure to wear a PFD. In this case, in a relatively calm current, a life jacket certainly would have increased Jack's chance for survival. Given a head injury, his failure to wear a PFD may have sealed his fate. This stretch of the Missouri appears to be innocuous. Fishermen, canoeists, rafters, and even inner tubers flock to the river in good weather (on a warm weekend, it can be a veritable zoo), usually without serious mishap. As illustrated here, even the most innocuous water can be dan-gerous. Don't take the rivers you float for granted. Wear your PFD. Primary rescue gear for white water paddlers. Can be used in many water sport situations. Throw bag consists of: 50 feet ofyellow ¼" floating poly line, 900 pound test. Durable drawstring bag with built in float. Resists rot and mildew. Type I PFD. This is for rough, open water. It is the most buoyant of all PFDs and will automatically turn your face up in the water, even if you are unconscious. The disadvantage is that it is quite bulky and not all that comfortable to wear if you are really active in the boat. Type II PFD. This is commonly (but not necessarily fondly) known as the horse collar. It is for relatively calm inland water where the chance for a fast rescue is fairly good. The advantage is that it will float you high and will turn you face-up if you are unconscious. The downside with this PFD is that it is uncomfortable (especially around the top of the neck) and it provides none of the insulation value that other PFDs com-monly do. Beyond some specific children's sizes, one size in the horse collar pretty much fits all. You can pick up some version of this one at just about any discount sporting goods store. This PFD is so uncomfort-able that most people are tempted to take it off. Once it's off, it's awkward to get back on so, in a crisis, it is effectively useless to you. If you plan on doing anything more than lily dipping around the local pond, skip this one and buy something you will wear. Type III PFD. This is the PFD that you will most likely see on the river. It's designed to be comfortable while paddling or fishing. Type IIIs allow you to get a really close fit. One disadvantage is that, unlike Types I and II, the Type III PFD won't float you face-up automatically. It is the choice of most serious floaters because, when properly fitted, it will give you good buoyancy while still allowing you freedom to paddle comfortably. Type IV PFD. These are the throwable devices. They encompass every-thing from life-saving rings to buoyant cushions, if your boat is a canoe or kayak or less than sixteen feet long, the law does not require you to carry these in the boat. It's not a bad idea to carry one in any event. Type V PFD. These are inflatable devices, usually inflated by a CO2 cartridge. Make sure you choose the PFD most suitable for your activity. If you are running rivers, some variation of the Type III will be your best choice. On July 6, 1996, three adults and three children (aged two, three, and five) launched a ten-foot raft on the Clark Fork River upstream from the head of Alberton Gorge, a popular and challenging whitewater stretch. The adults in the party were inexperienced boaters. While the details of this accident are sketchy, it appears that not everyone was wearing a PFD. Apparently, the victim, two-year-old Ethan, was wearing an adult-size PFD. At Rest Stop Rapid, the first rapid at the head of the gorge, the raft flipped. Ethan fell out of the raft and was not seen again. Several days of searching failed to turn up either Ethan or his life jacket. On the day in question, the weather was clear and the air tempera-ture was 80-plus degrees F. The river, however, which is challenging at any water level, was unusually high for early July because of a heavy snowpack. 2. Dangerous conditions. Even though Rest Stop Rapid is challenging at low flows, it was even more hazardous than normal for early July because of the heavy runoff. The difficulty of a river can vary greatly depending on the flow level. Improper fit of PFD. A PFD that doesn't fit properly may still allow you to drown. It will just take a little longer. While the lack of proper fit was extreme in this example, the bad fit can be much more subtle and still lead to drowning. All too often, perfectly loving, caring parents outfit their kids with whatever happens to be handy in the way of PFDs. As illustrated by the previous example, the results of this approach can be disastrous. Of all the pieces of equipment in boating, your kid's PFD is not the place to scrimp. Get a good quality PFD that fits. If your child is under twelve, get one with leg loops that keep the jacket from riding up and get one that will keep your child face-up. A properly designed PFD for an infant or small child will include a crotch strap, flotation collar, and a grab loop. The upper reaches of the Sun River below Gibson Dam pour through a narrow chute, accelerating the flow and making it extremely turbulent. In 1989, during a canoe-instructor training course, Bruce and Diane tipped over while practicing eddy turns. The swift current quickly swept them downstream. Bruce, wearing a wet suit and high-quality PFD, found himself in momentary trouble. Here's what happened, in his words: "When I first hit the water, my first thought was "Wow, it's cold" (this was late May). I knew I had to get out of the water fast, so I let go of the boat and started kicking for shore. I quickly realized that my vest was not keeping my head completely out of water. The water line was right at my lips, and each time I drew a breath, I took in water. For a few seconds, I thought I was going to drown. Once I got through the panic of that thought, I started kicking harder, breathing more carefully, and managed to get to shore. It was a strug-gle. The problem? My vest was too big and rode up on my body so it wouldn't float my mouth above water. I went out the next week and bought a new vest." When buying PFDs, people tend to err towards a jacket that is loose fitting. Typically the rationale is comfort. "If it's too tight, it will chafe and pinch;' they'll say. Or "if it's too tight, I can't breathe." While both of these can be true, it is possible to get a snug-fitting, comfortable PFD. Wearing a loose PFD can be fatal. A loose-fitting PFD may float you, but likely not high enough to keep your mouth and nose above water. As a result of wearing a loose-fitting PFD, you stand a good chance of drowning with most of your head above water-a unique, and altogether unpleasant, experience. 1. Put on the PFD you want to buy, zip it up, buckle the belt, and pull the adjustment straps until they are snug (ideally, the PFD should have a range of adjustability so that you can get a snug, but comfortable fit over a range of clothing, from a T-shirt to a pile sweater to a parka or rain-coat). Try some paddling motions to make sure the PFD doesn't chafe or impair your range of motion. 4. Don't sit on your PFD-take care of your PFD. 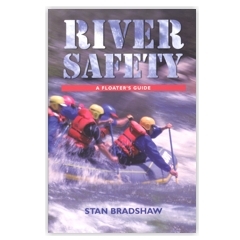 Read more of Stan Brandshaw's "River Safety." Just click on the picture of his book and go to Tom's TopKayaker Shop to purchase. For further reading, Tom's titles and more.